A brick is a brick is a brick. Or is it? Here we must take issue with this hasty Gertrude Stein-ism and declare that there is a massive amount of variety in what most might consider to be just another pile of bricks. It’s no secret that bricks vary from region to region (thanks to differing clays, sizing standards, and traditions of either using, or not using, a frog) but even among bricks laid in the very same house, there is quite a diverse mix on display. Cutaway of a corner rowhouse showing three types of brick: face brick up front with a thin layer of white lime-Portland mixed mortar, common brick directly behind it with sloppy mortar work, and ‘hard’ brick for the side wall. Before delving too deep into the nuances of kiln placement and firing temperature (saved for a future post), let’s begin with apples and oranges, the face bricks and common bricks. 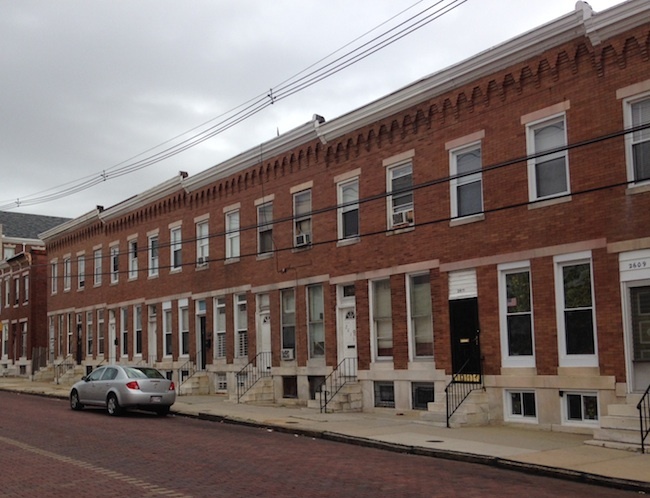 Common bricks make up the vast majority of the Baltimore rowhouse. 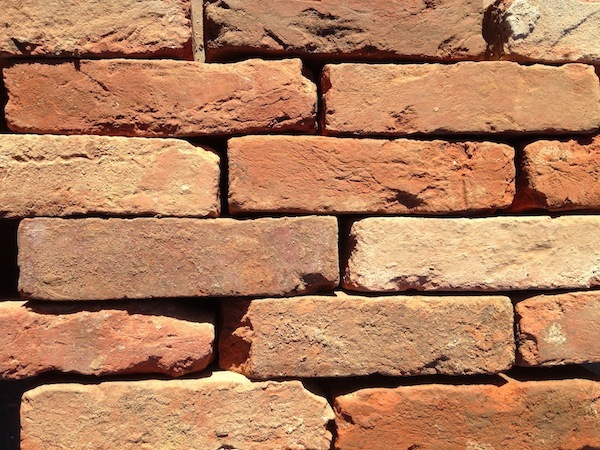 While there are various types of common bricks used to create the party walls, rear wall, and interior wythe of the front wall, they are all essentially the same brick with the same dimensions and basic properties. 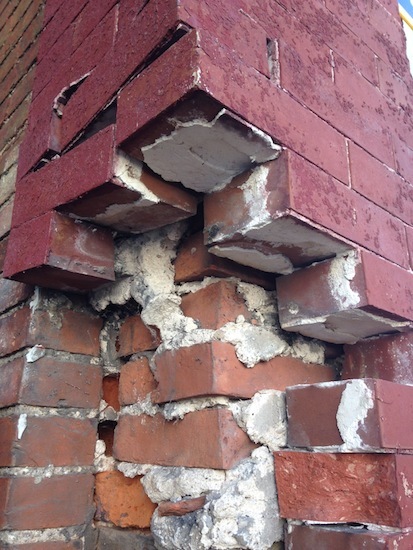 These bricks can be crude affairs: sizes can vary by a 1/4″ from brick to brick and corners are often imperfect. This group of common bricks, (post-salvage and dry stacked without mortar) shows their irregular nature. 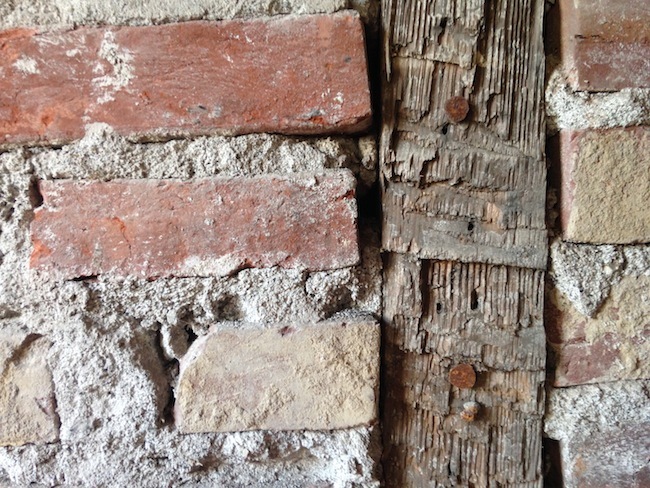 Some chips and cracks occur during the salvage process, but these bricks were born imperfect. 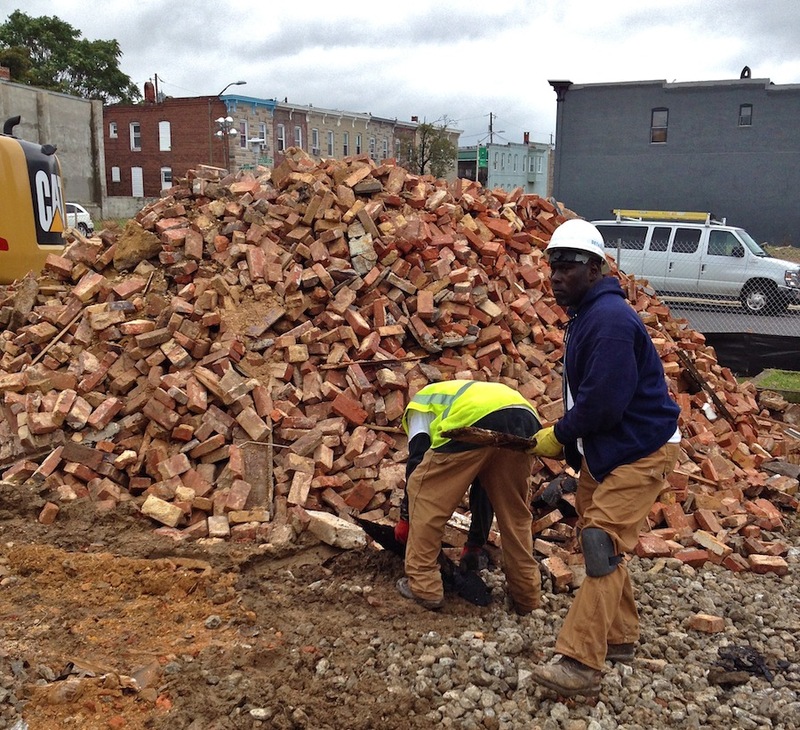 During the late 19th and early 20th century, common bricks, in Baltimore and elsewhere, were almost always made relatively close to the construction site, probably within a span of a couple miles. Before widespread use of the automobile, these bricks would have been carted by mule, so proximity was key. Once they arrived on site, they’d be laid rather quickly in thick mortar beds. Why the thick beds? Pardon the following SAT question: Gustav the bricklayer is making a wall. Bricks cost 5 cents apiece, and mortar costs virtually nothing. He can use either 1/16″ or 1/2″ mortar beds: which will allow him to use the least amount of bricks, thereby saving a ton of money? Common bricks in situ, showing super fat and sloppy mortar beds. Beyond decreasing material needs, thick beds enabled the mortar to set consistently around the rough edges of the common brick, allowing for straight courses. The crisp edges of face brick meant that thinner mortar beds could be used to beautiful effect. Around the turn of the century, face brick were often laid in a thin stripe of a lime-Portland cement mix. During the 19th century, Baltimore became famous for its pressed face brick and shipped the beautiful product up and down the East coast. By 1910, however, trade winds had changed, and the city that had once been a foremost producer of face brick became a major importer of it, as train cars full of face brick from Western Pennsylvania and Ohio flooded Baltimore. As new rows popped up along the city’s eastern and western peripheries, the houses were fronted with the telltale yellows and browns of PA and OH bricks. These bricks are nearly indestructible- if you see a Formstoned house on one of these rows, you’re witnessing the work of a damn good salesman. 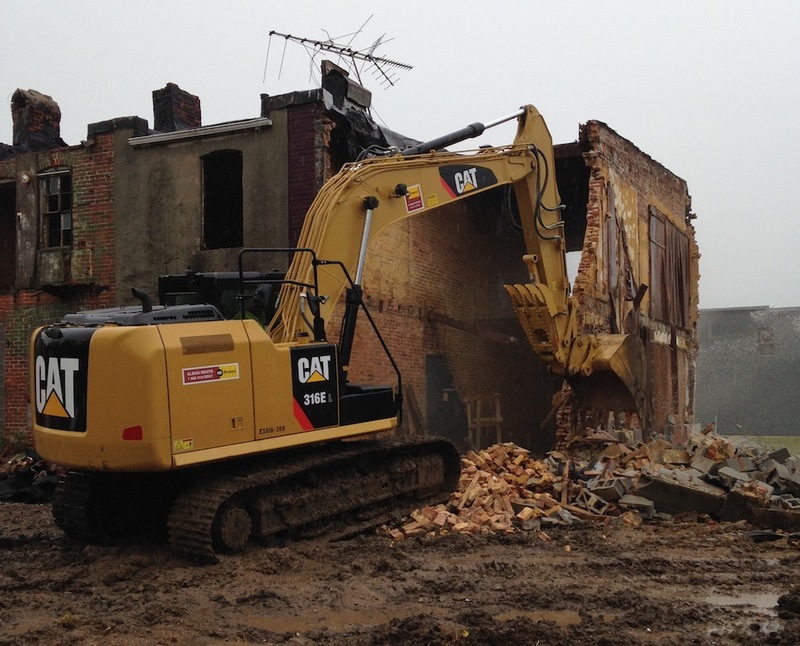 The first seven rowhouses on Eager Street have now been reduced to piles of bricks and mortar. Our job for the past week or so has been to take these piles and organize them into neatly stacked pallets of beautiful Baltimore brick. 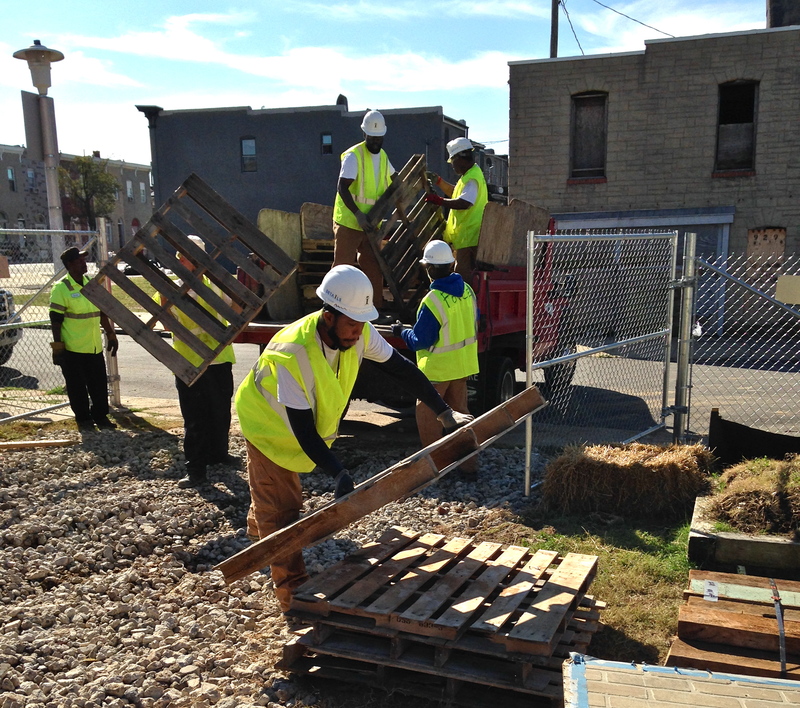 Before we began pulling bricks from the piles, we separated any wood matter so that it could be recycled. With our operator Reds’ help, we then transformed our massive pile of bricks into several slightly less massive piles of bricks. Reds scooped up shovelfuls of brick and deposited them in three processing areas. We then began the laborious (but very Zen) process of sorting through tens of thousands of bricks and identifying the ones we can salvage. 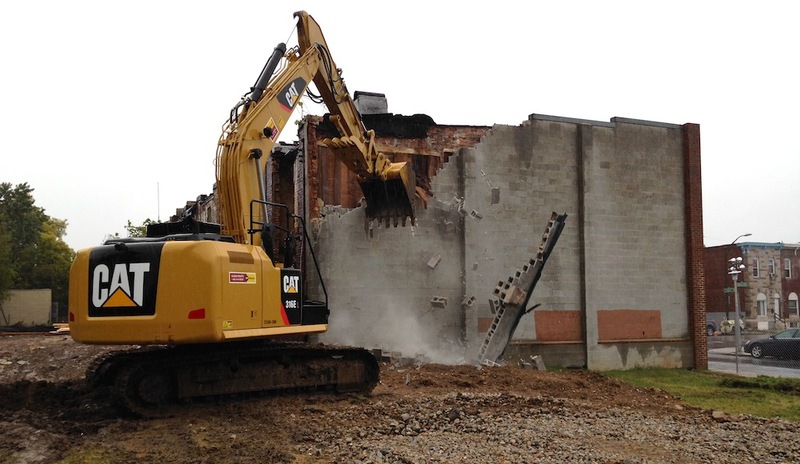 On our site, brick processing follows a three part rhythm: pick, clean, stack. 1. Complete bricks: no partial bricks allowed. 2. There must be a clean face with minimal to no chipping. Once these very basic standards have been met, we begin the process of cleaning the bricks. The idea here is to remove any mortar left clinging to the brick. The bricks from Eager Street were laid with lime-based mortar, which makes our job infinitely easier than if we had to remove Portland cement-based mortar. Portland cement became popular during the late 19th century, and by the 1930s it had supplanted lime as the primary binding agent in mortar. Portland cement mortar sets quicker and harder than lime mortar, which has made it a preferred construction material. For folks involved in deconstruction, it’s something of an arch nemesis; it’s just not practical to chip it away, tiny piece by tiny piece. Lime-based mortar, on the other hand, flakes away relatively easily and can be removed without too much trouble. The photo below shows some of the tools we use. 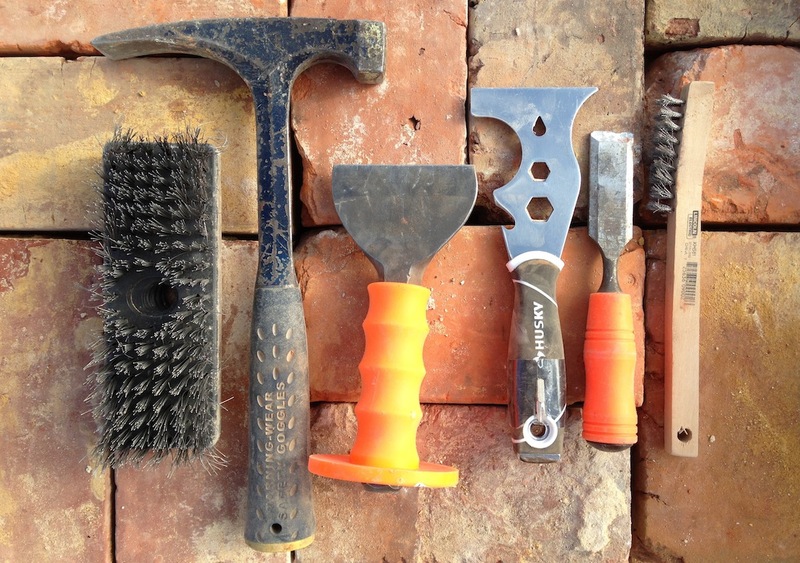 From the left, they are: a) a wire brush for removing bits of weakly adhered mortar, b) a brick hammer (sometimes called a mason’s hammer) that can be used to knock off chunks of mortar,with either the traditional hammer end used against a separately held chisel, or the chisel end used directly against the mortar, c) a mason’s chisel that can be used to break away chunks of mortar or as a beefy scraper, d) a 5-in-1 scraper tool to remove any stubborn bits of mortar from the brick’s surface, e) a smaller “beater” chisel that’s good for removing large chunks of mortar when placed just so, and f) a wire welding brush with slightly tougher bristles. 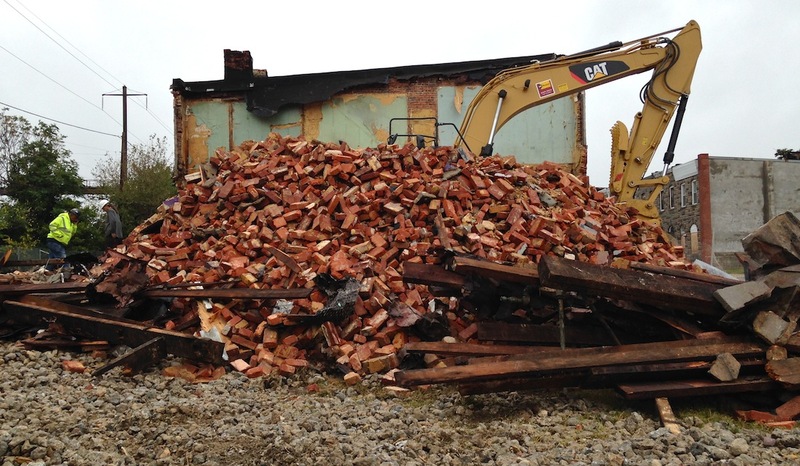 Once the bricks are cleaned, they’re tossed to a stacker who arranges them on pallets in a basket-weave pattern. We stack our pallets 13 courses high with 40 bricks per course for a total of 520 bricks per pallet. 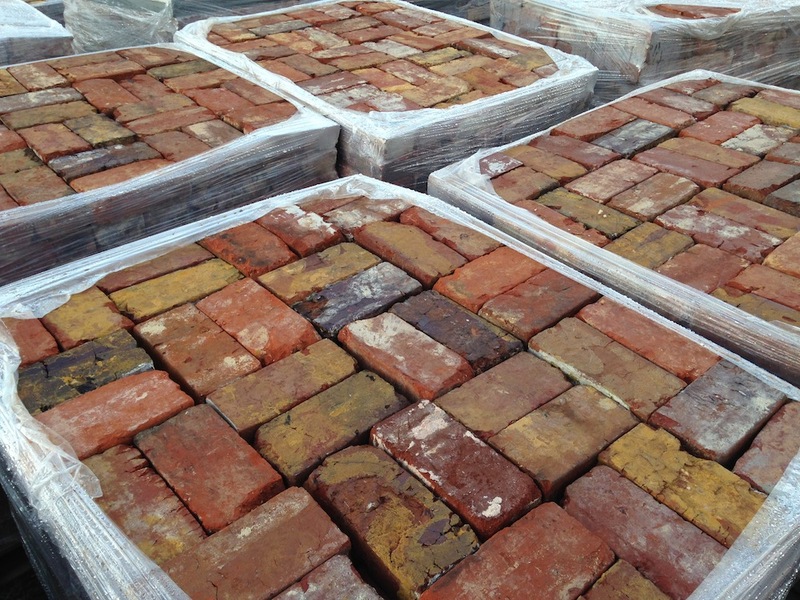 We then shrink wrap them and, voila!, a pile of century-old rubble turns into a gorgeous arrangement of reclaimed bricks, ranging in color from pomegranate (thanks to crew-member Reggie for the naming suggestion) to cherry red to a dark salmon hue. The north side of the 2300-2400 blocks of Eager Street may feature 35 houses with unique addresses, but it is basically a block long building. The very essence of rowhouses is that they are attached to neighboring houses- this can make for tightly knit neighbors bound by a shared sense of space and responsibility (“mi casa es su casa”- literally), or it can make for frustrating sleepless nights while you listen to your neighbor watch reruns of Golden Girls through a paper-thin party wall (no hard feelings, Don, it’s fine, really). From an engineer’s perspective, the essential interconnectedness of rowhouses means that the structural integrity of one home can affect the integrity of its neighbors. This created some tough decisions for us as we faced the next steps in our deconstruction of Eager Street. During our initial inspections, we had discovered that out of the first seven houses we’d be deconstructing, three had collapsed completely. The roofs had failed in all three, allowing rain to penetrate the structure- water seeped through floorboards, which then saturated joists, which ultimately turned to mush and collapsed, leaving a pile of the material formerly known as wood in the basement. We’d toyed around with different techniques for manual removal of the bricks, but none of them were practical considering that certain houses were no more than teetering piles of masonry. With nearly half of our first batch of houses collapsed, and considering that the condition of one house affects its neighbors, we decided that removing the walls mechanically was the only safe option. Before we brought in the machines, we did manage to pop some bricks off the back walls manually. 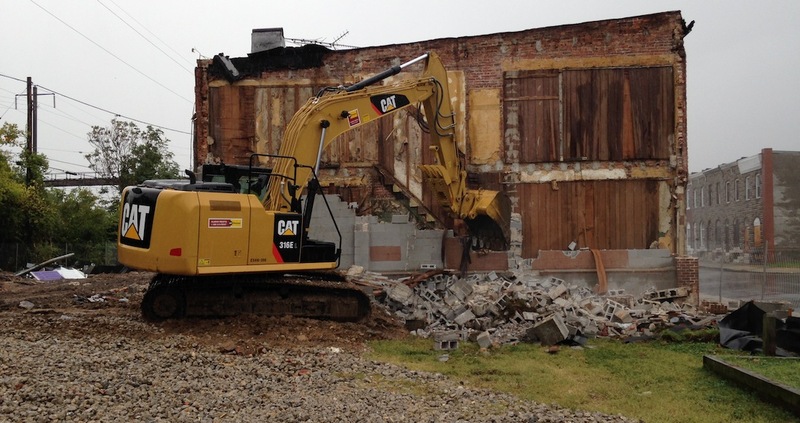 Once we’d harvested all the bricks we could, we brought in the excavator. Our operator, Reds, works like a surgeon, only his scalpel weighs over 17 tons. The first step was to claw back a block buttress wall that had been laid when several neighboring houses were torn down years ago. Below you can see just how precise Reds is: once he clawed away the block, the old party wall was revealed with faux wood paneling still intact. Once Reds had cleared the block wall, he went around back and began to claw away at the rear wall. Towards the right of the frame below, you can just make out the stream from a fire hose that’s used to control dust. We were lucky to have a rainy day while Reds did his thing, but a hose for dust control is always a must. To the right of the photo is a pile of joists that Reds was able to grab (we’d left them in place to give the first house some structural integrity). To the left of the photo is an assorted pile of scrap metal and smaller pieces of lumber. And that big red pile in the center is what we’ll be working on for the next week: a beautiful mountain of bricks to process! Stay tuned to see how they clean up. Now that the joists have been cut from the first few houses on Eager Street, the structures consist of little more than brick, mortar and roofing material (rafters, inch-thick decking, several generations of various tar-based substances). 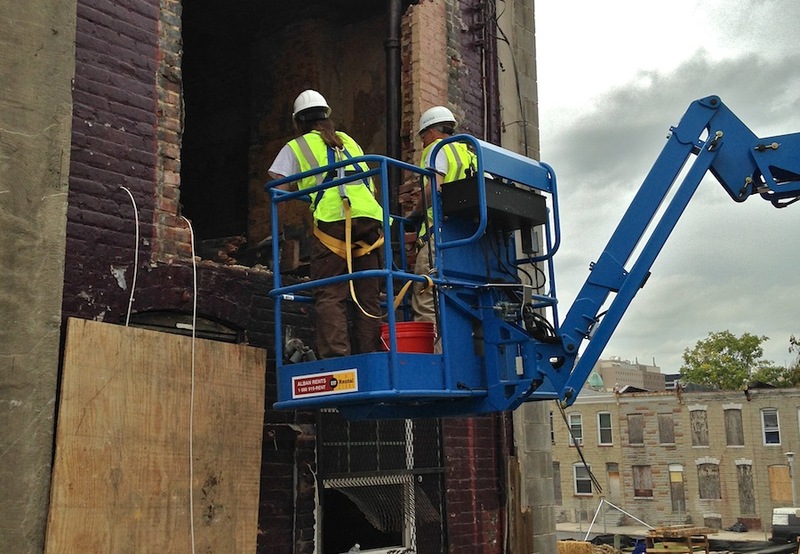 The bricks from these century-old structures will soon relinquish their roles as structural rowhouse particles and will assume new lives as reclaimed antique bricks in historic preservation projects, patios, pathways, commercial and residential interior accents, pizza ovens, art projects and even new construction. But before they can attain these reincarnated states, the bricks must be brought down from the houses, cleaned, stacked, and packaged. 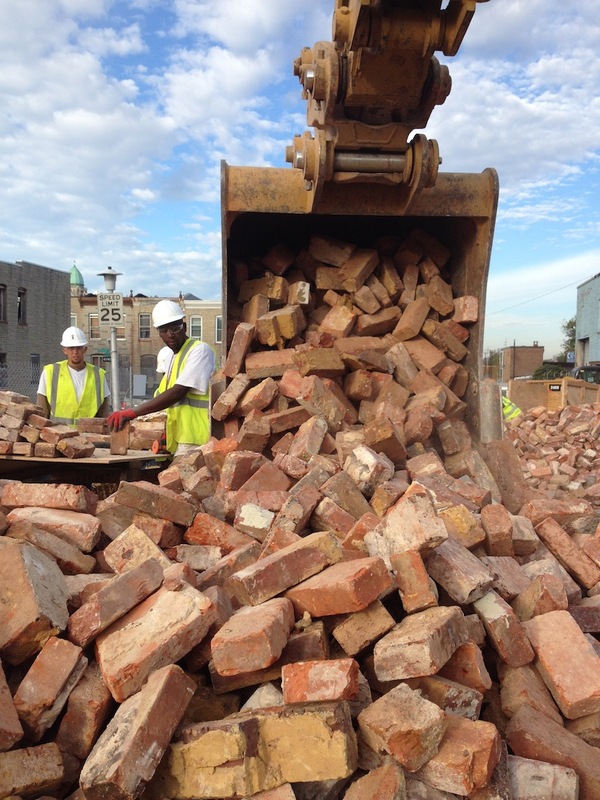 In Phase One of the project, we’re aiming to salvage around 21,000 bricks from the first seven houses on Eager Street. Managing that sort of quantity can be overwhelming, so before the first brick is removed, we’re setting up a staging area and organizing all of the tools and materials we’ll need for efficient processing. The photo above shows the crew unloading the first of dozens of pallets we’ll be filling over the next few weeks. Follow our progress via email!